magnitude that will be read with reverence for generations to come. The most comprehensive Numerology Reading on the Internet! Richard Andrew King is the teacher's teacher, the archeologist of numerologists. Deep, detailed and prophetic. This information will change the way you live your life. ~ Cyndi Silva, Metaphysical Wisdom. Other numerologists may refer to themselves as master numerologists, but Richard Andrew King is the King of numerologists. of being where one can only guess or hint at the truths, motivations and directions of one's life that are Pre-King. God created everything by number, weight and measure. [Sir Isaac Newton]. Everything is determined, the beginning as well as the end by forces over which we have no control. of life in its detail. as in the turn of tides. of a life that is divine. has its design in numbers. Chart Reading on the Internet!" Numerology is the ancient art and science of numbers wherein numbers and their corresponding letter values establish vibrational patterns determining our lives and destinies. Christ said, "the very hairs of your head are all numbered" [St. Matthew 10:34], thus establishing the universal principle of predestination. Other Masters have expanded on this spiritual fact of predestination by stating that, in fact, not only are the very hairs of our head numbered, but every breath, step and heartbeat of our lives are also numbered and preestablished before we exit our mother's womb. Numerology is, basically, a divine cosmic code of predestination establishing a blueprint for each of our lives. This code is set forth in our full birth name and birth date. God did not drop us here without a plan and that plan, as fantastic and extraordinary as it may seem, is in our birth name and date, a divine blueprint allowing us to see beyond the veil of the external world and into the cosmic superstructure of our lives. One of the major purposes of numerology is to assist people in gaining a deeper understanding of themselves in relation to their life's Divine Design. With that understanding there is the hope that they can live life more efficiently, adjust to its ever-flowing tides more smoothly, move with a more direct purpose, exude more confidence and express greater balance, awareness, harmony, peace and understanding. The benefits of numerology are many. Primarily, it can help us understand both the divine design of our lives and who we are as earthly personalities in this incarnation. In our next human life, should we have one, we will have an entirely new name and new birth date, thus giving us a different personality and different destiny. When we're born, it's as if we are hooked up to a track which pulls us through the different situational, vibrational fields of our life. These cosmic energy fields define our destiny and compel us to act in ways commensurate with the unfoldment of that destiny. Once we know that destiny, and who we are in a cosmic sense, we can make appropriate adjustments and, therefore, gain a greater degree of peace and harmony other than that which we might otherwise possess. Perhaps one of the greatest benefits of numerology study is that we can help our children to grow harmoniously into their lives and beings. Every child, every soul, has his or her own personality and destiny. These may be very different from, and in contrast to, the destinies, personalities and wishes of the parents. By knowing the cosmic blueprint of our children, we can thus guide and support them much more effectively and keep them and us in touch with who they are, not who we might want them to be, and support them in the direction in which they are going which may not be the direction in which we would want them to go--as long as that direction is, of course, healthy and holistically focused. Thus, much unnecessary, painful, destructive, non-productive, inharmonious and non-beneficial energy between parent and child can be avoided. Our children can then grow into their own resplendent light and find their own way in life successfully and . . . beautifully. Another major benefit of numerology is that we can get to the depth and substance of our relationships quickly and substantially. Through numerology, there is no need to spend years, even decades, knowing that significant other or others. We can practically know them instantly, know their assets and liabilities, their strengths and weaknesses, their desires, traits, natures and main issues of life. If each partner in a relationship--whether it is personal, business, social, etc.--could know the other deeply in a cosmic sense, the probabilities of creating understanding and harmony in the relationship are extremely increased. And, it might be pointed out, that this new millennium is marked by the "2". Thus, it will be a thousand year period in which relationships are brought into extreme focus. Yet another benefit of studying numerology is that, although we cannot change our destiny, we can at least plan for it. If we know there will be stormy days ahead, then we won't get caught off-guard in a rosy fog. If we see sunshine ahead, then we can relax and enjoy it. In any case, at least we can know what is going to happen in a general sense, and, it is axiomatic, that to be forewarned is to be forearmed. Our destinies cannot be changed. It is spiritual law. Aside from planning and being forewarned of impending vibrational influences, we can also acquire a confirmation of our intuitions. Most sensitive people seeking knowledge of their lives really do know the answers they seek. They are just looking for confirmation. Certainly, numerology can help in this regard, too, thus giving the sentient individual a sense of peace and calm regarding life's events and occurrences. Richard King’s Numerology is, by far, head and shoulders above all the rest. I recently had a life reading with Richard. It was empowering. After having several numerology readings in the past, I was amazed at all the information I had been missing that Richard taught me. Numbers are the key to the universe which coincides with Astrology. It’s all God’s language, and it was amazing to me the depth of knowledge Richard offers in his readings with respect to how numbers impact every aspect of our lives. I came away with a better sense of my destiny, who I am and what my journey is about. Thank you, Richard, for your generosity of spirit. After learning from Richard Andrew King's numerological teaching, it is impossible to conceive of going back to that 'twilight naive and foggy' state of being where one can only guess or hint at the truths, motivations and directions of one's life that is Pre-King. Of course there are countless other authors that lay out common and accepted numerology principles, but Mr. King's approach is innovative and different from any other, also more accurate, as I have discovered in my own personal research and study. Other authors rehash or parrot the same old information. Richard Andrew King breaks new ground! It's almost as if the very Spirit of Numerology is using Richard King as an instrument to evolve this ancient science and take it to a new level at this time. I will say without hesitation that The King's Numerology is true and real. Richard Andrew King's knowledge of numbers changes intangible spirituality and divination into solid, practical, objective reality. In a word, Richard Andrew King brings science to the art and practice of divination and spirituality. He brings proof to the otherwise unprovable; solid evidence to the not so solid universe of the divine. The Kings Book of Numerology contains new information that informs and predicts more completely and accurately than any previously published numerological work. I personally feel Richard Andrew King is bringing back the empowered sciences of long ago, information long since lost upon this plane. 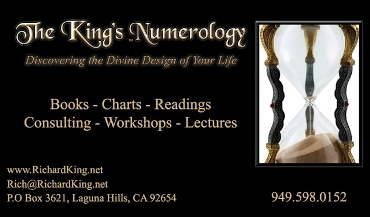 I would recommend The Kings Book of Numerology to everyone practicing or wanting to practice divination. All who read his works will benefit and be blessed. Richard Andrew King is the best! I have read your book, The Kings Book of Numerology. It is the best numerology book I've ever read. 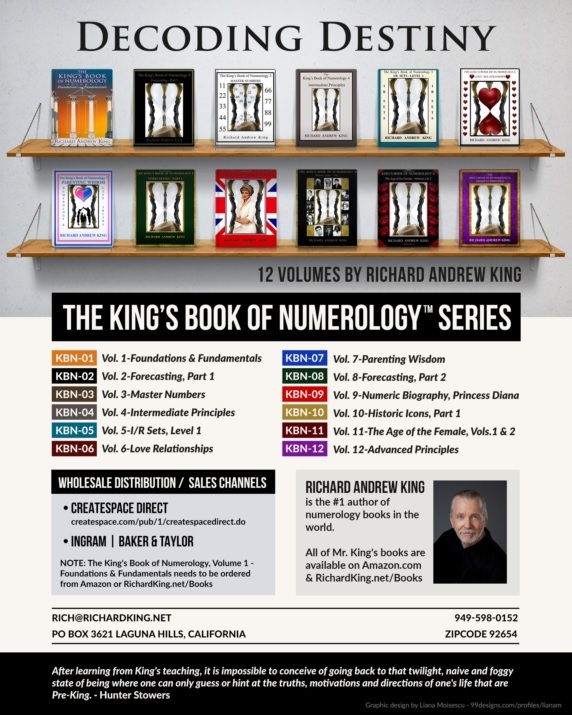 Richard Andrew King is our #1 numerology reference. I just got your book on numerology and I'm in the process of devouring it. Awesome! I've learned as much about numerology from reading your book the last few days than I have in my past five years of study. I have a feeling that this great opus that you've produced will become one of the classics in the spiritual science of Divine Numbers. Richard King's in-depth knowledge and research in numerology can open new doors to the inner soul and give insight to potential relationship building skills! There can be no doubt about the validity of Richard Andrew King's research and intuitive use of numerology. His application of this metaphysical science goes well beyond other ancient schemes such as astrology and the enneagram in giving us direction by clarifying who and what we are. I am finding Richard King's amazing in-depth system to be a fascinating ancillary to my work as a therapist. I am always looking for new tools for my toolbox, and as the field of psychology is embracing alternative modalities at an increasing pace, I would highly recommend psychologists and all counselors read Richard's books. I believe even the hardest-core skeptics will be amazed! Thank you for all the insights and knowledge I received from my numerology reading. I want you to know I have never felt more deeply touched by an individual as I did during your reading. The innovations, insights and organizational model of The King's Numerology have supported my personal transformation and inspired me to new levels in counseling others! The Kings Book of Numerology is one of the stellar books in its field offering application in a very practical way. I found Richard King's depth of knowledge extensive, accurate and impressive! Steve Vertun, President - Segue Corp.
What a marvelous freedom I've gained from The King's Numerology! Wow!!!! Sitting down with Richard King was amazing. Quite an amazing, accurate reading!!!! Incredible!! Now all the ladies in my spiritual group want readings!!! Wonderful! The King's Numerology is very spiritual, inspirational and accurate! The King's Numerology is indispensable for anybody trying to have a closer look at his past, present and future life! The King's Numerology, for which I am grateful, has helped me to become more self-realized by telling me what I needed to know, not what I wanted to know! The King's Numerology: I was impressed with the accuracy and found it very interesting! Services provided: Readings - Consulting - Charting - Seminars/Workshops - Speaking Engagements. RICHARD KING traveled the world in his youth as the son of a United States Air Force fighter pilot. Upon graduating from San Jose State University with a Bachelor of Arts degree in English and a Secondary Teaching Credential, King pursued a livelihood in the real estate industry, obtaining an Associate of Arts degree in real estate as well as a real estate broker's license. He also worked in the retail sales industry at the management level with the K-Mart Corporation. King also pursued his interest in the communication, media-arts field by attaining an Associate of Arts degree in Radio-TV-Film. During this time he hosted, produced and performed on-camera talent for a local college television program ("Around the Town"-Saddleback College). King has also produced his own public access variety television shows: The Mane Stage, Black Belt Masters Showcase and Horizons 2000. King, a life-time student of the arts, began studying martial arts while in college. He founded, owns and operates the "Karate Institute of America" in Orange, County, California (est.1979). King developed the "Kiado-Ryu" system of martial arts. For more information, click KARATE. Having an avid interest in the metaphysical side of life, King began studying the ancient science and art of numerology in 1980. His research and development initiated his beginning a numerological consulting business and publishing part of his research findings in The King's Book of Numerology, Volume I: Foundations & Fundamentals, The King's Book of Numerology, Volume II: Forecasting, Part 1 and The Age of the Female: A Thousand Years of Yin. For book information, click BOOKS. With an intrinsic love of words and sounds, King also published a Spoken Arts CD entitled Priceless Poetry and Prose, Volume I, a timeless collection of famous literary works which he dramatizes with a potpourri of entertaining voices. His second spoken arts CD, Poems of the Spirit, is a collection of some of his own spiritual poems. All of King's CDs can be viewed Here. "The most comprehensive Numerology Chart Reading on the Internet!" Current prices for readings are here. Full and accurate birth name and birth date (day-month-year) required. To schedule a session, contact Richard King by email. There are several paying options available: Pay online via Paypal using the button on this page; send a check to Richard King or go to the Homepage and use the aqua Basic Pay button.